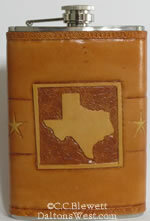 Dalton's West is where I sell the leather flasks or other items I hand-tool. Each is one of a kind and they are done purely for the love of the craft. That's why you'll only see one or two available at a time. So when you want something really exclusive and hard to get, visit me at Dalton's West to see what I've done lately.